On July 2, 2018, in response to a court order, the Environmental Protection Agency (EPA) published a proposed rule tightening its standards for lead in dust on floors and window sills for housing and child-occupied facilities built before 1978. The agency declined to lower the standard for lead in paint – citing insufficient information – and did not consider tightening the standards for lead in soil. While the proposed rule is a tentative step forward for lead poisoning prevention, as explained below, it will create unnecessary confusion and falls far short of what the science and the law demands. Comments are due by August 16, 2018. Pursuant to an order from the Ninth Circuit Court of Appeals, EPA must finalize the rule by July 1, 2019. 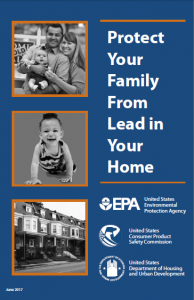 Last week, we noted in our blog that the Environmental Protection Agency (EPA) dropped the statement that paint, dust and soil are the most common sources of lead in its “Protect Your Family from Lead in Your Home” booklet. Property owners provide this booklet to prospective homebuyers and tenants in housing built before 1978. The change implicitly recognizes that there is no safe level of lead in the children’s blood, and we must reduce all sources of lead exposure. It also acknowledges that the relative contribution of air, water, food, soil, dust, and paint to children’s blood lead levels is complicated. Exposure varies significantly based on age of the home, the child’s race and age, the family’s income-level, and region of the country. Any simplification obscures these important differences. EPA’s scientists made this clear in a model published earlier this year that pulled together the available data, divided children into three age categories, and assigned children in each category into ten groups based on their overall lead exposure. For each group, they estimated the relative contribution of air, water, food, and soil/dust (from paint). Not surprisingly, children living in older homes with lead-based paint hazards by far have the most exposure to lead. For 1 to 6 year olds in the top 90-100 percentile, more than 70% of the lead in their blood is from soil and dust. The contribution from food is 20% and drinking water is 10%. For infants, soil and dust contributes to 50% of the lead in blood, while 40% is from water and 10% from food. Since there is no known safe level of lead in blood, we must do even more to reduce children’s exposure to lead-contaminated soil and dust. 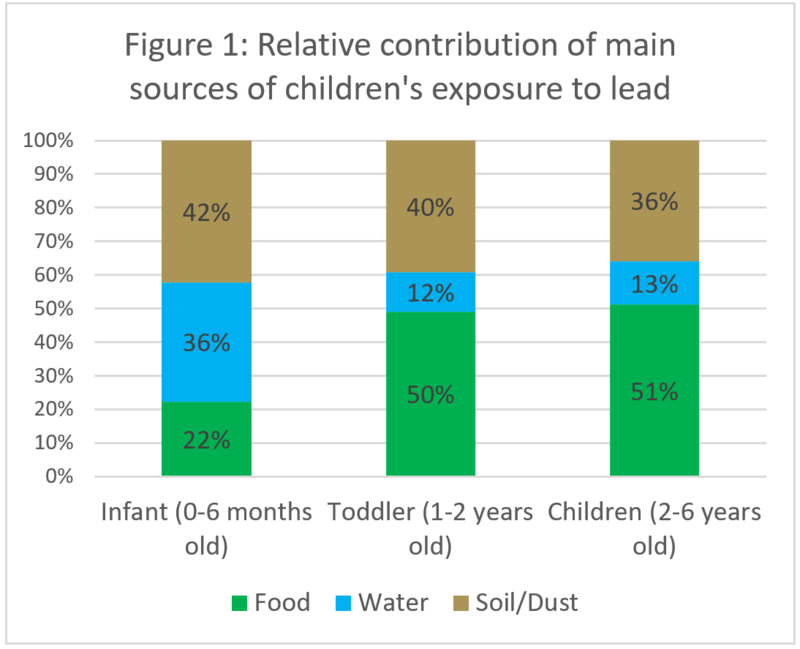 However, to prioritize action at a national level, it is important to understand how different sources contribute to lead exposure in the average child as well as the most-exposed child. We used the underlying EPA data to calculate the average relative source contribution of different sources to blood lead levels for infants from birth to six months old, for toddlers 1 to 2 years old, and young children from 1 to 6 years old. The results indicate that infants have a much higher source contribution of lead from water in comparison to older children (Figure 1). For the average child 1 to 6 years old, food is the largest source of lead exposure, with 50%, followed by soil/dust then water. 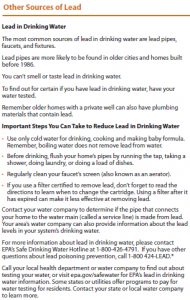 In June 2017, the federal government updated the “Protect Your Family from Lead in Your Home” booklet to expand the information provided on lead in drinking water from a few lines to a full page. Since 1996, when someone rents or buys a home built before 1978, the property owner or landlord is required to provide them with a copy of this booklet. The last update to the booklet was made in 2012. Statement that paint, dust and soil are the most common sources of lead. The new version does not make the comparison. See our September 2017 blog for the Environmental Protection Agency’s (EPA) latest estimates on sources of lead exposure. Running water for 15 to 30 seconds before drinking. The new version is silent on length of time to flush water and instead highlights taking a shower, doing laundry, or doing a load of dishes as options to flush the line at the tap. The change was necessary because homes with lead service lines, the lead pipe that connects the main under the street to the home, often experience higher levels of lead after 30 seconds of flushing. Lead pipes, faucets and fixtures are the most common sources of lead in drinking water. Reminder that older homes with private wells can have lead plumbing materials too. Some states or utilities offer programs that pay for water testing for residents. What are the new recommendations? Regularly clean your faucet screen (also known as an aerator). If using a filter to remove lead, follow directions to learn when to change the cartridge. Use only cold water to make baby formula. Contact your water company to determine if your home has a lead service line and to learn about lead levels in the system’s drinking water and water testing for residents. Call EPA’s Safe Drinking Water Hotline at 1-800-426-4791 for information about lead in drinking water and 1-800 424-LEAD for other questions about lead poisoning prevention. The United States has made significant progress over the past fifteen years towards reducing children’s exposure to lead. While much more needs to be done to eliminate the more than $50 billion a year in societal costs from lead, the progress is good news for children since it is well known that there is no safe level of lead in children, and it can impair their brain development, contribute to learning and behavioral problems, and lower IQs. Achieving this progress has required a diligent and ongoing commitment from all levels of government. If we expect to continue to make progress – and not backslide – the federal government needs to remain committed to reducing sources of lead exposure. So far what we’ve seen from the Trump Administration raises serious concerns about any real commitment to protecting children’s health, including from lead. Lead has a toxic legacy from decades of extensive use in paint, gasoline, and water pipes. As long as lead is in the paint, pipes, and soil where we live, work and play, progress is far from inevitable. Protecting children from lead takes constant vigilance, especially when the paint or plumbing is disturbed. Flint provided a tragic example of what happens when we turn away. Without vigilance, the positive trends we have seen in blood lead levels could all too easily reverse course and go up. That is why the proposed cuts to the Environmental Protection Agency’s (EPA) budget, which would eliminate the agency’s lead-based paint programs, are yet another indication that this Administration is turning its back on protecting children’s health. Housing supported by the Federal Government should not be poisoning children. That was the simple message Congress delivered to the Department of Housing and Urban Development (HUD) in the Residential Lead-Based Paint Hazard Reduction Act of 1992. Despite some real progress since then, recent cases of lead poisoning in federally-assisted housing in Chicago and Indiana suggest there is still much work to be done. Thanks to a strong public push to highlight these failings, HUD recently proposed changes to its “Lead Safe Housing Rule.” At the heart of these changes is lowering the level of lead in children’s blood considered “elevated,” the trigger for local housing authorities to conduct detailed inspections of a child’s home for lead. HUD has continued to use a level of 20 µg/dL set in 1999, despite a consensus that lead is harmful to children at much lower levels. HUD is on track to finalize the rule in January 2017 after sending it to the Office of Management and Budget on November 21 for final review. Jan. 13, 2017 update: HUD issued a final rule that was similar to what was proposed. Tom Neltner, J.D., is Chemicals Policy Director. Imagine what would happen if firms like Zillow and Redfin that have transformed the real estate marketplace also helped consumers make informed decisions about health hazards in the home. By the time you read that dense paragraph, you’d have already chosen your new home, so you likely signed the forms and put the “Protect Your Family from Lead in Your Home” booklet in your to-do pile; a pile that all-t0o-easily gets lost in the chaos of a big move. Congress created this lead hazard disclosure requirement in 1992 as part of a comprehensive law designed to protect children from lead in paint. The objective was to transform the marketplace by having buyers and renters demand homes that were either free of lead paint or, at least, lead hazards. It has not worked out that way. The marketplace for lead-free or lead-safe homes never materialized, and sellers and landlords have little to no incentive to look for problems that might complicate the transaction.